BOXING is one of the original betting sports in the world. Punters have been laying their cash on the head-to-head battle since the sport was introduced and it’s never been more popular. Betting on boxing isn’t just about which fighter will win, our recommended bookmakers have a wealth of betting options which makes every fight an exciting and profitable fight. Despite numerous claims that the UFC has taken over as the most popular fight sport in the world, the sheer popularity and betting figures towards boxing suggests that isn’t so. Boxing is the original fight sport and it’s where punters can get the best value for their money. Bovada supply markets for all major and minor upcoming boxing fights. Their easy-to-use website allows punters to see the odds for win and draw on the same page, making betting decisions much easier than some other websites. They offer competitive odds and they excel in offering value odds for the underdog fighters. They have markets for all the prime time fights available to be bet on right now. Sign up at Bovada today and take advantage of the free cash on offer in bonus bets! There are many different betting options for boxing, but the most popular option is the head-to-head bet. This bet simply means punters must select the winner of the fight. This market suggests that Mayweather Jr is the firm favourite to win the fight. In most other sports, bookmakers would use a points spread system to even up the market difference, but this doesn’t apply when betting on boxing. Some bookmakers will also offer a draw option. In this instance, for a fight where one fighter is the warm favourite, bookmakers will offer from $21 (+2000) – $41 (+4000) for a draw to occur. The draw is a relatively rare occurrence in boxing, but they are more frequent in the high-profile bouts. When a draw occurs with a bookmaker that didn’t offer a draw option, odds will be halved. Mayweather’s original price of $1.31 would become 65 cents, therefore punters would lose more than their original bet. Bettors on Pacquiao will receive $1.51, which gives them a profit on their bet. This is where bettors select the method of victory in the fight. Fighters can win either by knockout, technical knockout, technical decision or disqualification. Bettors can choose between these options: KO, TKO, TD, DQ or win by decision. Winning by decision means that the fight goes the distance and the judges will decide the winner of the fight, based on a points scoring system. This method of victory is extremely popular for bettors, especially when the two fighters are evenly poised and a knockout isn’t expected. The knockout option is the more exciting of the two and the odds will typically be more appealing, unless the fight is expected to be very one-sided. Foreman is at the same odds for a knockout victory as he is for a victory by decision due to the unlikely nature of knocking Ali out. 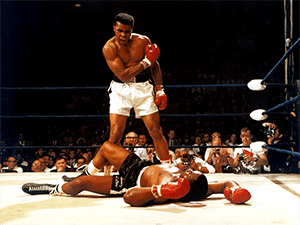 The clear top pick in this market is Ali by decision – this is because both fighters are of equal talent but Ali is expected to win the majority of the rounds. Punters can bet on which round they think the fight will stop in. Most fights range between 8-12 rounds which makes this option tough to figure out, however, the rewards are significant. Early round betting is where the odds are the biggest. Middle to late rounds are at shorter odds than the opening rounds but in an evenly-contested fight, odds for the later rounds will be around $20-$30 (+1900 – +2900). Boxer A ($1.40), Boxer B ($2.80) – head-to-head betting market. As the fight goes longer, boxer B drifts in the betting as the likelihood of a late knockout decreases. He starts out as the favourite in the early rounds but the two prices quickly become even before the well-favoured boxer firms up in the market. This betting option is extremely popular for bettors who seek quick and big payouts. There are a few exotic boxing betting options available, including knock down specials, will the fight go the distance? and group betting. Knock down specials apply to when boxers get knocked to the canvas, but don’t get knocked out and lose the fight. The fighter must receive a count from the ref for this bet to be legitimate. Will the fight go the distance is a simple yes or no option for bettors. They must select whether or not the fight will last the full amount of rounds scheduled. The majority of fights do go the distance, therefore the “Yes” option is usually well favoured and sits around the $1.33 (-300). The “No” option is around $3.25 (+225). There are also a wealth of option available for alternate total rounds. Bookmakers will put up totals such as Over 9.5, 8.5, 7.5 etc, and punters must decide whether or not the boxing fight will have more or less rounds than the bookmakers are offering. There are 17 different weight classes in boxing with the Heavyweight and Super Welterweight/welterweight divisions attracting the most popularity among bettors. Although there haven’t been any prime-time heavyweight bouts in recent history, the division is considered to be the pinnacle of boxing and the best fights throughout time have often included heavyweights. Names such as Mohammed Ali, George Foreman and Mike Tyson were all heavyweight champions and the list of incredible names goes on. Super welterweight/welterweight has been popularised with the Floyd Mayweather Jr vs. Manny Pacquiao rivalry. Having never met in their career, these two fighters were destined to brawl at one point in time and even the potential thought of this fight has been enough to carry this division into the headlines. *Due to the different boxing organisations around the world, we’re taking the current WBA champion, as well as the The Ring champion. The Ring is a boxing magazine which ranks fighters. The fight that has been years in the making will finally come to fruition on May 2 at the MGM Grand in Las Vegas, U.S.A.
What promises to be the most popular fight this turn of the millennium, the unbeaten Floyd Mayweather Jr (47-0-0) takes on the man from the Philippines Manny Pacquiao (57-5-2). Mayweather is looking to protect his unbeaten record against one of the toughest pound-for-pound fighters in history and although he has faced more athletic fighters with better records, this fight against Pacquiao will go down in history. Whilst many people think this fight has come years too late, it’s still going to be a cracking fight and the pay-per-view sales will be through the roof. The amount of money bet on this fight will also be astronomical as many punters are split between the two when it comes to popularity. Most of the early money has come for Pacquiao as punters are reluctant to take the $1.33 around Floyd Mayweather – except those playing multi-bets or parlays. The fight is predicted to go the full 12 rounds as neither possesses a deadly knockout punch, and the fans and bettors alike will be hoping they see a lengthy, tough and testing battle between the world’s best welterweights.